What’s the big deal with chives and why do people like them so much on their baked potatoes? I spent 22 years working for a steakhouse in Los Angeles. We specialized in prime rib and big steaks. We served rib eyes, top sirloins, fillet mignon, New York strips and tri-tips. We accompanied these steaks with a starch and the most popular as you can imagine was baked potatoes. Our baked potatoes were really good. We brushed them with canola oil and sprinkled them kosher salt. They baked for about an hour and when they were done the skin was nice and crisp. There was almost a shine to them. I learned the key to a great baked potato after just a few days on the job. It’s all about how you cut it. Most people at home will slice the potato right down the middle leaving two perfectly smooth discs. When you put butter on them it slides right off and onto the plate. We opened the potato using a fork. We made a crisscross pattern lengthwise and then pushed slightly on the sides. The potato opened like a flower and the fluffy potato inside resembled the peaks of a mountain. The butter seeped in drenching the potato. Back to the chives. Everyone always had chives on potatoes. I had never seen them used for anything else. They smell really nice and I have learned recently that they’re great in a salad. I don’t eat too many baked potatoes. I am trying to appear healthy. 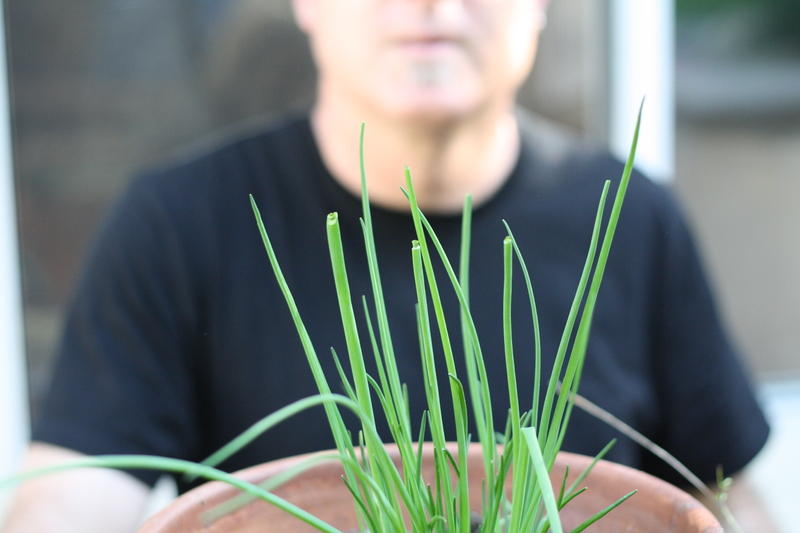 I have some chives growing in a pot in the back. I recently added some compost to the chives and they have taken off. They are green as can be and seem to be shooting right up to the blue sky above. I know I won’t use them for a baked potato and when they are plentiful I will figure out what to do. Any suggestions.